Penn State researchers employ a variety of techniques to search for exoplanets and brown dwarfs, including the Doppler, transit, and direct imaging. Of these techniques, astronomers can only “see” a planet with the direct imaging technique. This method is best suited for discovering brown dwarfs, young planets orbiting far from their host star, and perhaps rogue planets speeding away from their host star. Most exoplanet detections are via indirect methods. In the transit method, astronomers measure the brightness of many stars to detect slight dimming of the star passes in front of the star and casts its shadow our telescopes. Using the transit method and NASA’s Kepler mission, astronomers have discovered of planets, mostly orbiting close to their host star and with sizes between that of Earth and Neptune. Using the Doppler method, astronomers make precise measurements of the velocities of stars to discover planets and characterizes their masses and orbits. So far, the Doppler method has discovered mostly giant planets, with masses similar to Saturn or Jupiter. Penn State faculty and students are leaders in developing instruments and conducting observational campaigns to extend the Doppler technique to reach planets more similar to Earth. In particular, the Hobby-Eberly Telescope is being upgraded to have an improved high-resolution optical spectrograph and a new infrared spectrograph (the Habitable Zone Planet Finder). Additionally, Penn State is a partner in the Minerva observatory to search for low-mass planets using intensive high-precission Doppler observations of bright stars. Fabienne Bastien uses high precision, space-based photometry from missions like NASA’s Kepler and TESS to facilitate the radial velocity detection of exoplanets. Rebekah Dawson uses transit, radial-velocity, and direct imaging surveys to measure properties of planets that constrain theories for planets form and evolve. Eric Feigelson uses autoregressive statistical models to reduce stellar activity noise and improve the detection of planetary transit signals in the NASA Kepler mission dataset. Eric Ford characterizes the architectures of planetary systems in collaboration with multiple planet survey teams. Ford is collaborating with advisees and statisticans to apply machine learning algorithms to develop improved stellar activity indicators and algorithms for distinguishing stellar activity and planets. Ronald Gilliland led an early (1999) HST survey forexoplanets in the globular cluster47 Tuc, and has been a Co-Investigator with the Kepler Mission since 1994 contributing to several aspects of the search for and characterization of exoplanets found via transits. 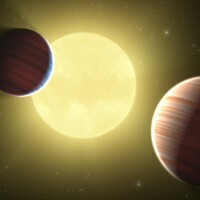 Dr. Gilliland provided the first suggestion to utilize centroiding through transits to eliminate the bulk of background eclipsing binary false positives, and led initial efforts to qualify this essential technique. Fred Hearty specializes in the construction of astronomical instrumentation, and is currently contributing to the APOGEEE project for the Sloan Digital Sky Survey and Habitable Zone Planet Finder project. Kevin Luhman uses optical and infrared telescopes, including the James Webb Space Telescope, to search for free-floating brown dwarfs in the solar neighborhood and nearby star-forming regions, particularly those with the coldest temperatures and smallest masses. Suvrath Mahadevan is the PI for the Habitable Zone Planet Finder and NEID projects and is also the leader of a project using the APOGEE spectrograph to observe planet host stars identified by NASA’s Kepler mission. Larry Ramsey led the development of a pathfinder IR spectrograph for the Hobby-Eberly telescope and now contributes to the Habitable Zone Planet Finder project. Don Schneider contributes to the Sloan Digital Sky Survey, including the MARVELS and APOGEE projects that perform multi-object spectroscopy. Alex Wolszczan discovered the first extrasolar planets orbiting a pulsar in 1992. Recently, Wolszczan has conducted a planet search targeting evolved stars using the Hoby-Ebberly Telescope’s High Resolution Spectrogaph. Jason Wright conducts high-precision Doppler measurements of stars to discover and characterize the masses and orbits of planets orbiting them. Prof. Wright’s group observes with the 10m Keck Observatory in collaboration with the California Planet Survey, and is planning upcoming Doppler planet surveys using the upgraded Hobby-Eberly Telescope (HET) and MINERVA observatories. Wright is also project scientist for NEID Wright’s group also maintains exoplanets.org, which hosts a database of robustly detected planets and their orbital properties.